Lt. Pete Weir places a wreath on the previously unmarked grave of James L. Coe in ceremonies Saturday at Woodland Cemetery in Van Wert. Jim Wilson, a direct descendant of Coe snaps a picture of the moment. 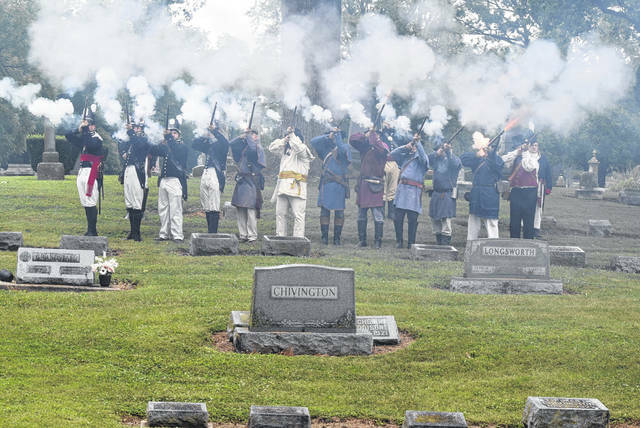 Re-enactors fire a 21-Gun Salute at a ceremony remembering James L. Coe, who had an unmarked grave, until recently at Woodland Cemetery in Van Wert. 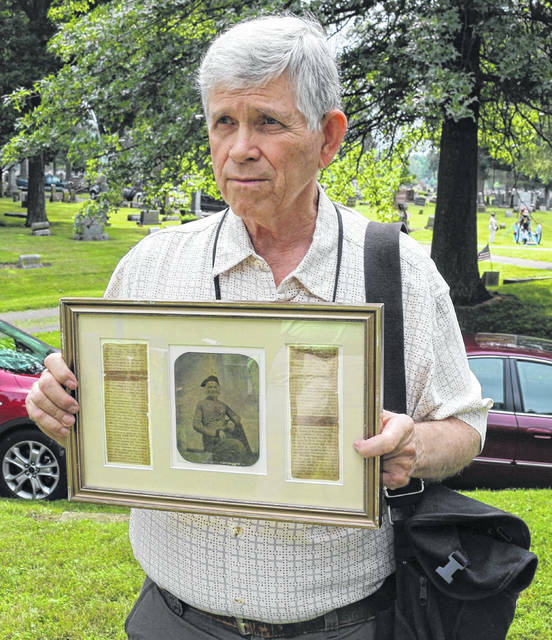 Jim Fisher, a direct descendant of James L. Coe, brought along a picture of Coe and his obituary. 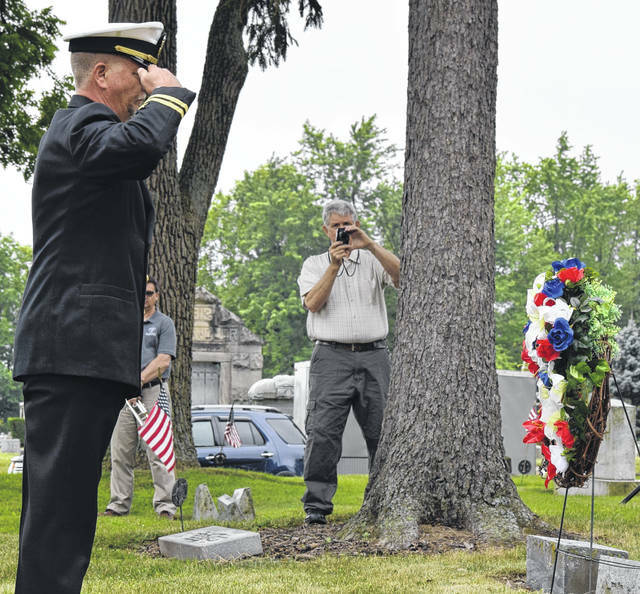 VAN WERT — James L. Coe finally got his military graveside service. Coe, born July 4, 1776, was buried in Woodland Cemetery in Van Wert in an unmarked grave 109 years later. On Saturday, veterans groups, along with military re-enactors, gave Coe the send-off he deserved. Van Wert County Veterans Commissioner Bill Marshall discovered Coe didn’t have a grave marker and sought help in obtaining one through the American Legion and Veterans Service Office. “One of the things we do as veterans is whenever a veteran dies, we’re there at the grave to salute them with a 21-gun salute. This man never got that chance. It wasn’t offered because it was 1885 and they weren’t doing ceremonies at that time,” said Marshall. The Lima News recounted the story of Coe last week and because of that article, a sixth general relative of Coe was found. “I got a call on Thursday night. This gentleman introduced himself and he said, ‘I know you don’t know me because my last name is Wilson, but I’m a direct descendant of James Coe.’ I nearly fell over my chair because we did not have any local or find any descendants at all, and for him to turn up was really a God thing,” Marshall recounted. “The ancestry goes back to Grandpa Coe, who died in 1885. My daughter is Assistant Curator of the Denver Museum, and she called me Monday night and she said, ‘Dad, they’re honoring Grandpa Coe up in Van Wert, Ohio and placing a stone on his unmarked grave. You got to be up there.’ So here we are,” said Jim Wilson of Cincinnati, who drove up with his wife to attend the ceremony. Wilson even brought along a metal plated picture of Coe and a copy of his obituary. 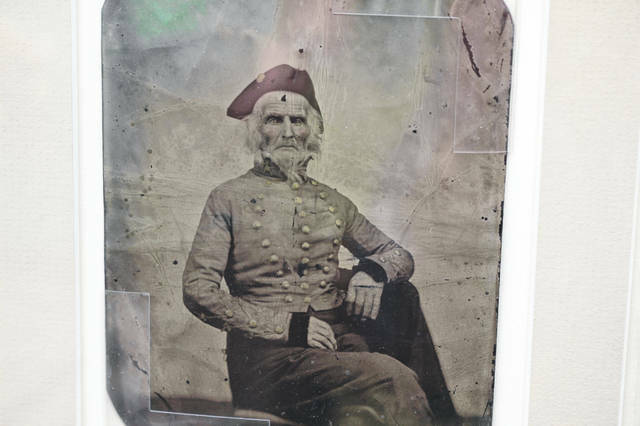 “This is his picture at approximately 100 years old,” Wilson said. Coe had two sons and three daughters. Wilson is directly related to one of the daughters. Is Coe the only veteran in Woodland Cemetery not to have a grave marker? “To my knowledge, there’s not, because I’ve talked to the superintendent here and that was the only one he recognized that was a veteran. I wouldn’t be surprised if there weren’t others, and somewhere along the line when we find them, we’ll do the same thing for them,” added Marshall.